Glendale, Arizona is an extremely popular location with all types of Arizonans, from snowbirds to vacationers to full-time residents. One of the reasons it is so loved is that it has wonderful events and festivities, especially through the holiday months of the year. 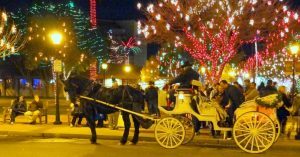 Downtown Glendale is famous for an award-winning holiday lighting event called Glendale Glitters. This event begins in late November and continues through early January. Daily, from 6 to 10 p.m., families and individuals across the region flock to see the stunning display of over a million lights through 16 blocks of historic downtown Glendale. Now in its 20th year, Glendale Glitters is the largest free holiday light display in the state of Arizona. There are also events held on Friday and Saturday nights through December 16th that include Jingle Bell Rockin’ Nights, Winter Wonderland Weekends, and an inspiring Spirit of Giving Weekend. 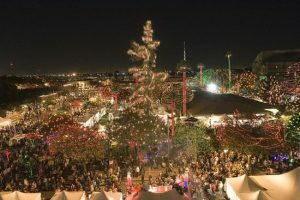 These events allow you to enjoy the glittering lights with family and friends and to grab a bite at one of the many fine dining establishments in the area. Glendale offers critically-acclaimed restaurants of every type. These weekends are also a time to find unique gifts from the boutiques and collectible stores that line the streets of downtown Glendale. With all of the options, you will be able to find something for everyone on your list. Downtown Glendale also offers a perfect photo opportunity. A 30-foot Christmas tree festooned with lights makes for a perfect holiday photo setting. You can even take a ride through the historic district in a horse-drawn carriage. Glendale’s holiday lights have been recognized by cbsnews.com as one of the Top Five Displays in the country. One home even uses 300,000 lights, 60 trees, and 100 animated figures in its crowd-pleasing display. We cannot say enough about this beautiful event. Speaking of the holiday season, we have three convenient locations in Glendale, Arizona for your holiday storage solutions. When it’s time to pack up the decorations, contact one of our storage facilities near you to see how we can help!